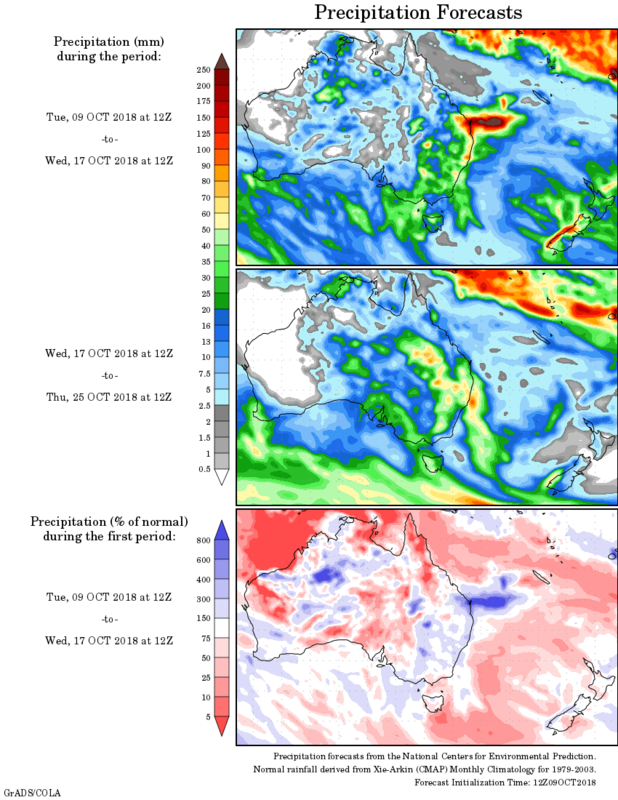 WELCOME rain over the past week in parts of New South Wales experiencing rainfall deficiencies, while low pressure systems and associated troughs produced rainfall for south west and south east Australia. Past seven days: During the first few days of the week, an upper level trough and associated surface trough extended from northwest and central Queensland into western New South Wales. A low pressure system developed in northern central New South Wales and moved slowly towards the northeast coast and brought isolated thunderstorms and widespread rain over almost all of New South Wales and into southeast Queensland. Moderate falls were recorded in the Lower Western and Central West Slopes districts, as well as in smaller areas along the east coast of New South Wales and through southeast Queensland. Light to moderate falls continued over coastal regions as the low lingered near the coast well into the middle of the week. In the west, a low pressure system near the southwest coast, and associated broad surface trough, moved slowly eastward over Western Australia during the first half of the week. The systems produced thunderstorms and moderate rain over the Goldfields and Southeast Coast districts, and lighter falls across the southwest and Nullarbor regions of Western Australia. At the end of the week, troughs extending around the northern coasts of Australia and from the Kimberley through Central Australia to far southeast South Australia, were associated with extensive cloud and embedded thunderstorms. Mostly light falls were observed along a band extending from the west of the Northern Territory to western Victoria, though isolated locations received moderate totals. In the last day of the week a cold front crossing Tasmania and areas of low pressure over the mainland southeast also contributed. Meanwhile the eastern end of the trough and the low pressure system lingering off the New South Wales Coast, saw continued falls from southeast Queensland to central coast New South Wales. Rainfall totals exceeding 50 mm were recorded along the coast of New South Wales from Port Macquarie to the Illawarra. Totals in excess of 100 mm were observed at several locations, including the highest weekly total of 297 mm at Careys Peak in the Upper Hunter region of New South Wales. Isolated rainfall totals in excess of 50 mm were also recorded at some locations in the Capricornia, east Darling Downs and Southeast Coast districts of Queensland. Rainfall totals between 10 mm and 50 mm were recorded in much of the southern South West Land Division, Southeast Coastal and southern Goldfields districts in Western Australia; patches of inland southern, central northern and far southeast regions of South Australia; pockets in western and far eastern Victoria; western Tasmania; southwest, central and eastern New South Wales; and southeast Queensland. An area of Western Australia from the southern Goldfields to the coast around Esperance observed totals in excess of 25 mm for the week, as did areas in a band through inland eastern to western New South Wales, though as the falls were associated with storms and showers coverage was patchy. Little to no rainfall was observed over northern Western Australia; almost all of the Northern Territory; northwest and northeast South Australia; the central third of Victoria; parts of eastern Tasmania; and most of Queensland away from the southeast.